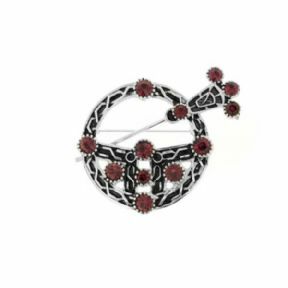 Finely rhodium plated, this stunning brooch is enhanced with an Amethyst coloured stones, is inspired by the Scottish 'Fiery Cross'. In Scotland, the Fiery Cross, (in gaelic 'Crann Tara'), was used as a method of raising the fighting men of a clan, and the sight of it commanded all clan members to rally to the defense of the clan. The most recent use was in 1745, during the Jacobite Rising. Highland clans were at constant war with each other, usually trying to steal land or cattle (or both! ), so the clans had to always be prepared and vigilant in case of attack. Members of the clan would run through the clan lands with a Fiery Cross and, at the sight of it, all clansmen were expected to meet at the clan rendezvous point, ready and armed to defend the clan. The Cross was viewed with awe and reverence, and woe betide any clansman that ignored it! This unique Brooch will be despatched to you direct from our showroom in the heart of Edinburgh's famous Royal Mile, located right next door to the Old Canongate Tolbooth and the Canongate Kirk, both locations which feature prominently in the Outlander books. The Brooch is presented in an attractive black and gold gift box. It will make a loving gift, and a lasting momento, for any Outlander fan.